A contractor based out of Denver recently contacted Ground Penetrating Radar Systems of Colorado to conduct a private utility locate. The contractor was planning to install roughly 40 signs, and prior to placing the caissons into the ground, the wanted to the job site scanned for utility lines. There was a lot of underground utilities running throughout the property that the general contractor did not know exactly where they were located and so they had GPRS come out to clear each one of these sign locations. With the technology that GPRS uses we were able to locate around each one of these locations so they could drill successfully and have no worries. We use an RD 7000 along with a transmitter to direct connect to a utility that emerges from the ground on one end and trace it to the other end. We also use a 400 MHz radar antenna to locate any unknown utilities in the area that do not emerge from the ground. If you are interested in learning more about our concrete imaging capabilities or other Ground Penetrating Radar applications such as locating utilities and sub-surface anomalies along a proposed pipeline trench, locating Underground Storage Tanks (USTs), clearing boring locations of possible utilities for soil samples, void detection, or even structural investigations. Don’t hesitate to contact us for more information or to hire us for your next project no matter how big or small the project may be. 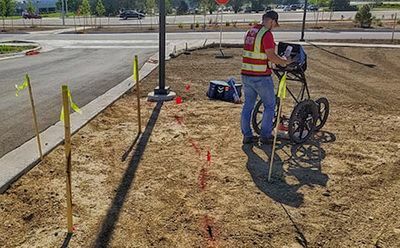 Ground Penetrating Radar Systems has an office local in Denver, CO serving all of Colorado and Wyoming as well as having offices all across the U.S in all major cities and states. Please feel free to contact our Denver office at (303)775-8270 or contact Troy Bullock direct at (720)688-1362, you can also email me at troy.bullock@gprsinc.com.